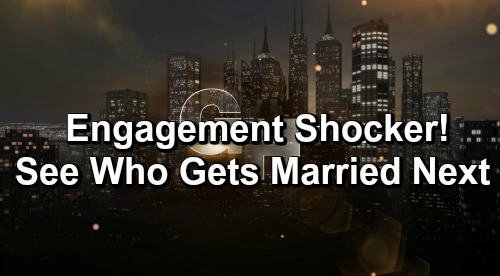 General Hospital Spoilers: Engagement Shocker Leads to Big Wedding – Which GH Couple Will Tie the Knot Next? General Hospital (GH) spoilers tease that one couple’s relationship will grow even stronger. In fact, wedding bells could be in their future! Which GH pairing may be ready to take a step forward? Based on some hot new info, there’s a chance Anna Devane (Finola Hughes) could have an engagement ring on her finger soon. Dr. Hamilton Finn (Michael Easton) has a quirky personality, but he really makes an effort to show Anna he cares. Finn has fallen hard for Anna, so he’ll want to do something special. This may also have something to do with Alex Devane Marick’s (Finola Hughes) cryptic hint as she boarded the GH elevator. Alex suggested that Anna should pass along a message to Robert Scorpio (Tristan Rogers). She wanted him to know she’s sorry she couldn’t see him one last time. It sounds like Anna will start to worry that Robin Scorpio-Drake (Kimberley McCullough) isn’t really her daughter. The possibility will horrify Anna, so she’ll need Finn’s support as she works to learn the truth. Some of Anna’s memories are her own, but others belong to her twisted sister. Of course, we have to point out that Alex was furious over being taken into WBS custody. She’s a vengeful person, so it seems likely that she’s deceiving Anna just to mess with her. Can you imagine if General Hospital actually rewrote history and made Robin Alex’s child? Soap fans would go ballistic! It was bad enough when they fired Genie Francis (Laura Webber). The backlash was swift and fierce, so we’d like to think GH knows they’d set off a firestorm with that kind of Robin revelation. However, many of those irate fans would welcome a Peter August (Wes Ramsey) rewrite. Reliable General Hospital insiders confirm that Peter will indeed be Alex’s son, so this Robin thing seems like a step to get Anna there. It should help her figure out the truth about Peter. Still, Anna is sure to be a mess over all this family drama. She’ll need to know she has something she can rely on no matter what. Naturally, Finn will want to be that person for Anna. He may even make a grand gesture to prove he’s all in. On April 5, Finn will be prepared to take a big step. Will he propose to Anna? Will he assure Anna that he’s going to remain a constant in her life? General Hospital spoilers state that it could be time for another engagement and perhaps a wedding eventually. Anna just has to say yes first! Since Anna loves Finn and is committed to their future, maybe she’ll be willing to go along for the ride. Would you like to see Finn and Anna tie the knot? Do you think a shocking proposal is on the way? We’ll give you updates as other GH news comes in. Stay tuned to the ABC soap and don’t forget to check CDL often for the latest General Hospital spoilers, updates and news. General Hospital Spoilers: Hayden Barnes Return Status Revealed – Has Rebecca Budig Been Contacted by GH?